This unique book presents original research from the largest cross-national survey of the epidemiology of mental disorders ever conducted. It provides the latest findings from the WHO World Mental Health Surveys based on interviews of nearly 150,000 individuals in twenty-six countries on six continents. 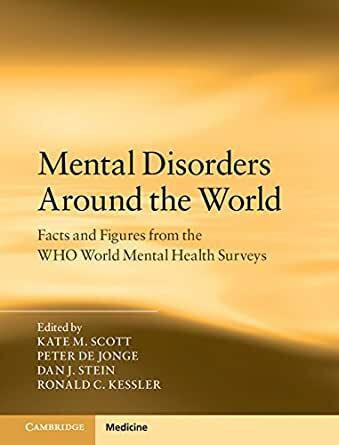 The book is ordered by specific disorder, with individual chapters dedicated to presenting detailed findings on the prevalence, onset timing, sociodemographic profile, comorbidity, associated impairment and treatment for eighteen mental disorders. There is also discussion of important cross-national consistencies in the epidemiology of mental disorders and highlighting of intriguing patterns of cross-national variation. This is one of the most comprehensive summaries of the epidemiology of mental disorders ever published, making this an invaluable resource for researchers, clinicians, students and policy-makers in the fields of mental and public health.